With a relatively new administration at the helm of the country, business-friendly policies and a thriving tourism industry have infused a sense of optimism over the past two years. This upbeat mood has been underscored by the proliferation of construction of both residential and commercial properties. “Greater disposable incomes and growing aspirations for better lifestyles have led to an increase in demand for land and apartments. The demand in Colombo is chiefly for apartments and houses since land is not freely available. In the suburbs of Colombo, the demand for land is pegged at about 40 percent while that for houses stands at about 60 percent,” she reveals. Perera believes that real estate prices remain inflationary and would settle at lower rates if not for brokers. According to her, they tend to push prices up artificially, often convincing landowners that the going rate for a property is much higher than the market can sustain. “This becomes unsustainable; but as a result, landowners tend to quote astronomical prices for which there are no buyers,” she opines. REGULATORY WOES Over the past few years, the real estate sector has been characterised by haphazard development, led by new entrants to the market, many of whom have no real experience in this business. CUSTOMER REDRESS The Condominium Management Authority can do little to redress complaints once a transaction has been completed. A newspaper report reveals that owners of flats in as many as 236 condominiums, largely in Colombo, do not hold deeds to their properties. One of the stumbling blocks has been the lack of Certificates of Conformity (COCs), perhaps because of non-conformity in constructing the edifices. This prevents developers from registering deeds of declaration with the Land Registry, which allows them to transfer ownership. HOUSING TRENDS A recent trend in the sector has been the upsurge in apartment purchases in the mid-market price range of between Rs. 10 and 20 million, which is where the real momentum lies. Although the luxury segment is also growing, the pace has been slower. 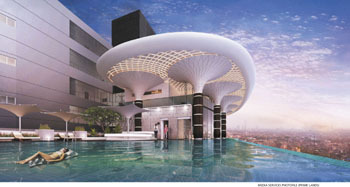 Yet, by 2020, it is expected that 6,000 luxury units will be available. EXPAT DEMAND Apart from local buyers with high aspirations, developers are also targeting the Sri Lankan diaspora and foreigners to invest in their projects. In 2015, the government announced plans to remove the 15 percent land leasing tax for foreign investors. And subsequently, it was proposed that foreigners bringing in US$ 300,000 will be granted a five-year visa in Sri Lanka and can acquire apartments. They’ll even be eligible to apply for loans of up to 40 percent of the value of a property they expect to purchase. 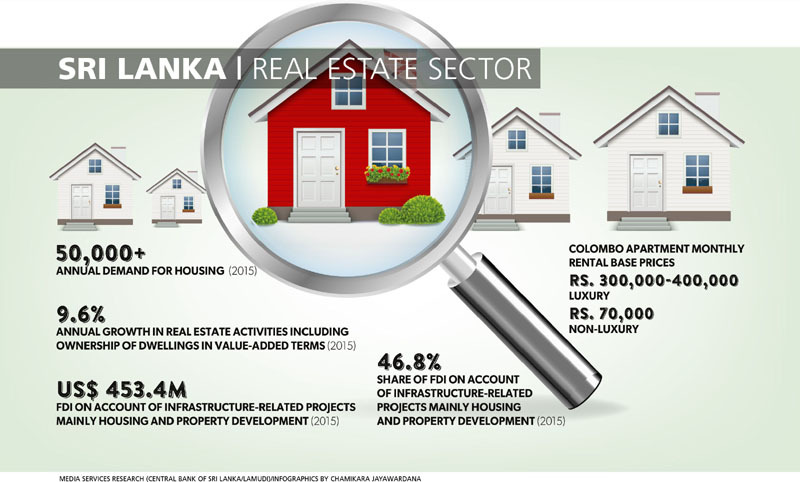 These favourable developments should boost foreign investor interest in Sri Lanka’s real estate sector. And Perera stresses the importance of the sector to the national economy as it brings precious foreign exchange into the country, and is a key employer of both skilled and unskilled labour. In the aftermath of the war of nearly three decades, there’s been a boom in apartment sales. The diaspora has bought heavily in Wellawatte and Bambalapitiya; but since then, sales have slowed down. In the meantime, the Northern Province has witnessed an upsurge in house prices – by as much as 23.5 percent, as reported by the Global Property Guide for Sri Lanka. DEVELOPMENT IS KEY Meanwhile, the rental market remains steady with owners earning five to seven percent of the value of their apartments annually. Both short-term and long-term rental markets have grown. Online housing searches have also displayed a remarkable increase over the years. As internet penetration rises from the existing 20-25 percent range, property owners will have to ramp up their online presence to proactively interact with potential buyers. This might see the phasing out of the bricks-and-mortar real estate broking business in due course. Furthermore, Perera points out that improved public infrastructure such as roads, highways and so on will serve to boost the real estate sector. Disposable incomes in cities such as Kandy and Galle, and in the Gampaha District, have expanded – and they’re also witnessing the proliferation of apartment blocks. LABOUR SHORTFALL But while the skyline is dotted with cranes atop buildings and frenetic construction activity, the industry is dogged by a lack of labour. “If it is not possible to access the labour locally, the government must seriously consider allowing companies to import it from neighbouring countries,” she concludes.